Nicholaas Berchem came in contact with painting at an early age, as his father, Pieter Klaasze was also a painter, albeit an average one. In addition to his father, he was taught by Jan van Goyen, Klaas Moyaert, Pieter Fransz de Grebber, Jan Baptist Weenix and Jan Wils. In June 1642 Berchem joined the Haarlem painters' guild 'Sint Lucas Gilde'. Most of his life, Nicholaas Berchem lived on Bentheim castle in the countryside. He is thought to have undertaken several educational trips to Italy, as many of his landscapes, which were his main motifs up to 1680, were inspired by this country. 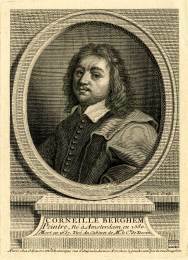 Among art historians, Berchem is said to be the most important exponent of the foreign, Italienate genre of Dutch landscape painting in the 17th century, to whose second generation of artists he belonged. His prolific productivity (approx. 850 paintings and 500 drawings) made Berchem one of the few well-paid painters of his time. In 1677 Nicolaas Berchem finally moved to Amsterdam, where he died in 1683. The scenes of Berchem are pastoral and take place in sunny Mediterranean landscapes. The part the sun plays in his work is very important. He made 61 etchings, among them 12 landscapes, the rest study's of animals.